I hope you all had a nice holiday weekend and were able to spend some time with family and friends. I enjoyed a nice break and spent most of the weekend offline. I posted my menu plans on Saturday and shared a few pictures on Facebook and Instagram, but besides that I disconnected for most of the weekend and it was just what I needed. 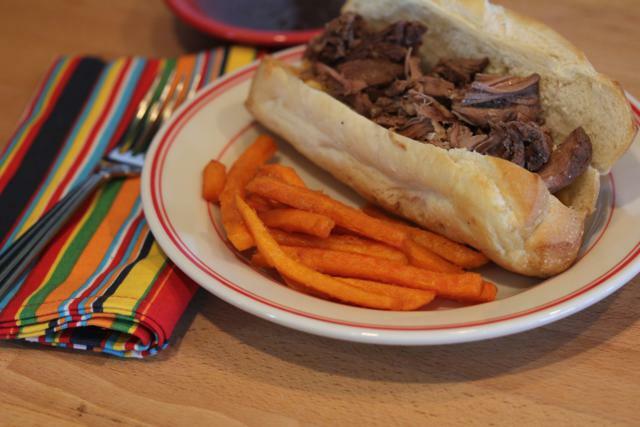 Today for Slow Cooker Monday I am sharing a simple slow cooked roast beef sandwich that is full of flavor. The meat filling for this can actually be eaten alone, but we loved it served as sandwiches. I love serving sandwiches during the summer because they are simple and more a light meal than we often have in cooler weather. I served this with sweet potato fries, recipe coming soon for those, but you could easily serve this with a nice side salad or melon during the summer. Cook on low for 7-8 hours or until meat is tender and shreds easily. Remove meat from slow cooker and shred meat. Pour some cooking liquid on top of meat. Just enough to moisten it, but not overly wet. Serve on buns and use some of the liquid for the Au Jus/dipping sauce. Serve each sandwich with a small bowl of cooking liquid to dip sandwich in. Looks delicious! This would definitely be a hit in my house! Lynn- my husband is newly gluten free and we were talking beer this weekend. He’s not a big drinker, by any means, but does like a beer once in awhile. What is your favorite gluten free beer? Or, any recommended to you? Thanks! I am probably not the one to ask on this because I don’t drink it. I cook with it and like the flavor in cooking, but I have never drank it. I don’t like it. I use just a basic gluten free beer I got at whole foods, but I am sure I have readers who will have suggestions. Would you mind if I used this as an Ask the Readers question in my allergy section to see what my readers have for suggestions? Sounds great! I appreciate it. And thanks for your site. I’ve been a reader for years and my husband just switched to a GF diet for health reasons. I purchased GF mixes- which we really enjoy. I so appreciate all your hard work- thank you! My husband is allergic to hops in beer. Any suggestions on what I can substitute in place of the 12 ounces of beer? The beer does two things in this. It gives it flavor and helps tenderize it. I think you could use beef broth and 1 to 2 tablespoons of vinegar. I would probably use red wine vinegar. I have not done that in this recipe, but I have in other recipes that call for wine or beer when I don’t have it on hand. The vinegar helps tenderize the meat in a similar way that the alcohol does. And now I know what I will add to my list of kitchen tips to share. I don’t think I have ever shared that one. I hope that helps. Thanks for the suggestion Lynn. To clarify…the recipe already calls for a can of beef broth, so I should use an additional can of broth, right? Yes, I would just add extra broth to make up for the missing liquid in the beer. You could probably also use wine, although wine would be a different taste and I would not use 12 ounces of it, but the wine would tenderize it. Perfect timing!! I put a roast in the crock pot before I went to work today. I’ve never made homemade au jus. is it basically beef broth with spices added? Maybe we will have sandwiches for dinner tomorrow night. That is if I can find some GF Buns. Yes it is basically broth that is flavored. 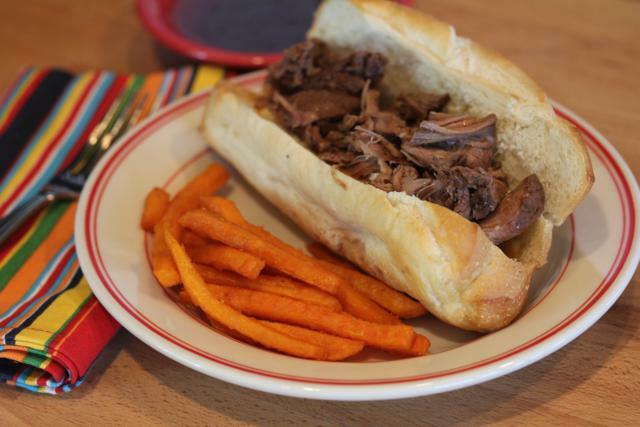 You can flavor it up in lots of ways, so it is a great way to use leftover roast and turn it into a roast beef type sandwich. I love this recipe. I don’t always put the beer in because sometimes we don’t have any, but it turns out great every time. And the leftovers often get turned into bbq sandwiches for the next day for a little change. And I put it in tacos a couple times too. So easy and a good garlic and onion flavor which goes well with many meals.